View our white gold rings here. Have you ever wondered what white gold is made of? Well you are not alone. Perhaps you have heard a story of a gold mine discovering a vein of white gold and announcing to the world the wonders of white gold? Probably not because that has never happened and never will happen. White gold is not found in the earth but is manufactured from yellow gold. The truth is that white gold diamond rings are made from yellow gold, with alloys added to make it appear as a shiny white metal. To make white gold, a jeweler will mix yellow gold with metals such as nickel, copper, zinc, tin, chromium, cobalt, palladium and sometimes even platinum. Nickel is the most popular metal used in order to make white gold. This can cause an issue as some of the population may be allergic to nickel in jewelry. If you know you are allergic to nickel, you can have Novori Jewelry make a custom mix of white gold that does not contain nickel. Ask a Novori sales associate for details regarding this. You should also know that all white gold rings are plated with a hard metal called rhodium in order to provide a clean, bright white colored gold. This plating of rhodium is microns thick and will wear off over time depending on how often the ring is worn and in what conditions the ring is worn. 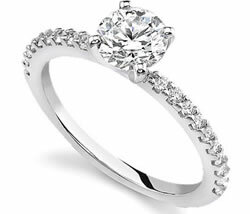 You should expect the rhodium plating on a white gold ring to last anywhere between 12 to 24 months on average. Some skin types will react with the rhodium plating and wear it faster than usual. It has been found that some of the oils excreted from the skin can react with the rhodium and wear down the rhodium plating faster than normal but this is quite rare. Most jewelers will re-plate your white gold rings with rhodium for a nominal fee. White gold rings are not maintenance free and will need this rhodium plating re-applied periodically over the life of the ring. The way to avoid this is to purchase a platinum ring which does not require rhodium plating but has a different color and of course costs much more! White gold was introduced in World War II as a replacement for platinum and is still just as beautiful in its own way as the yellow kind. Modern white gold diamond rings are actually stronger than their platinum counterparts, and of course you can often get them for half the price of a platinum ring. If you have an older white gold ring, it could be made of a mixture of platinum and yellow gold. This makes a ring that is less likely to show a yellowish tinge and is a is high-quality white gold that's stronger and shinier than regular white gold. Of course, you'd be giving up one of the chief advantages of modern white gold diamond rings -- that is, the discounted price -- but the cost would be less than that of a pure platinum ring. While white gold diamond rings don't scratch, bend or erode as easily as pure gold, they are just as beautiful to own as yellow gold rings. White gold rings are more popular now than they have ever been and the trend does not look like it is changing any time soon. Since white gold is not a naturally occurring metal, it has different alloys to turn the yellow gold into white gold. In order to achieve a white, bright color, white gold is rhodium plated which will need to be maintained over the life of the -ring. If you have any questions regarding how white gold is made of, you can contact our Novori Jewelry expert or call us toll free at 1-877-877-4141. We would be glad to answer any questions you may have regarding white gold rings.